Lindelani was born in KwaMaphumulo and presently lives and works in uMkhumbane (Cato Manor). In his series of sculptures entitled Memory, Meditation and Metamorphosis (plates 316-318), the artist has woven three sculptures of female bodies in wire. The intricacy and the intense labour that this process demands has strong resonance with the titles and conveys a loaded statement on the political situation in South Africa at present. Here, the very process of weaving itself becomes a meditative one where things intertwine, merge and unite. It is also a performative process, where dance and music, represented by the strings of a musical instrument, merge to resemble a ritual. Weaving is an art traditionally practiced by women, and Ngwenya has woven three female bodies while playing with the notion that mothers are the first to know, always know and are powerfully intuitive. He considers the feminine component to be a spiritual aspect in every human being, given its nourishing impulse. Meditation (plate 316), as a tool for remembering, brings the different members of the body together in the process of weaving; the body itself becoming a site of memory. Complete change, or a change into a completely different form is detailed in the work Metamorphosis (plate 317), where a female figure emerges from a larger, static male figure. From a fractured past, this transformation into a newer form brings memories to the fore, while reflecting on a current state of being. The material used to construct the male figure is ilala (reed) a substance that decays with the passage of time, whereas copper, the original gold of Africa, is durable, reflective and flexible, expressive of invisible states of being. Born KwaMaphumulo, Mkhumbane (Cato Manor), 1975. Training 1998-2000: Durban Institute of Technology, Diploma in Fine Arts. Exhibitions 2004: Black, NSA Gallery, Durban. 2004: Bathini Abantu, African Art Centre, Durban. 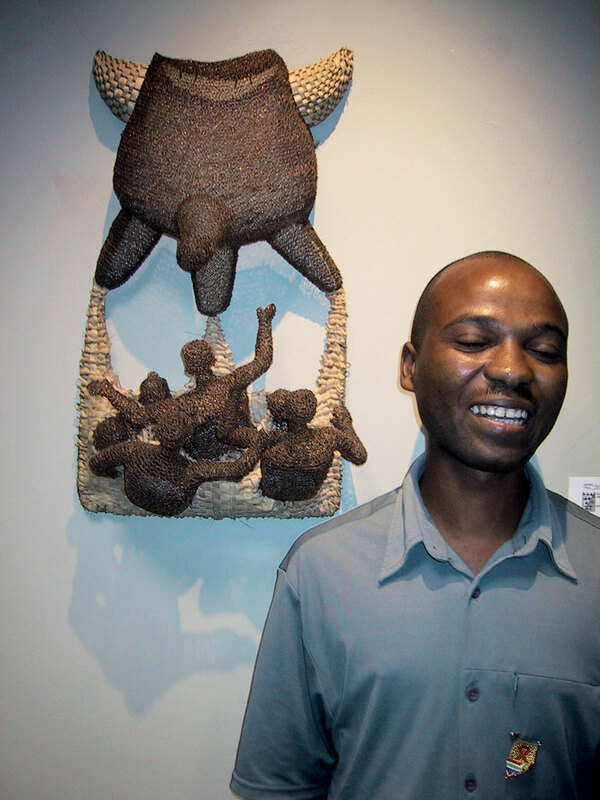 2002: Solo Exhibition, African Art Centre, Durban. Collections Durban Art Gallery; KwaMuhle Museum, Durban. Photographs of Lindiwe Lindelani. (left) Courtesy of Anthea Martin, African Art Centre Archives, Durban. (right) Bruce Campbell Smith.